Knock It Off With All The "Pairing," Okay? I got a nice bottle of amarone for my birthday and I was hoping to pair it with a tasty dessert recipe. My working idea is something in the stewed plum or fig vein but I am totally open to ideas. Honey pairs well with mild cheeses that have a little something nutty going on. Through de-construction we can arrive at our best pairing options… First, the dominant flavors here are likely caramelized pineapple and Vanilla. The problem with this kind of “pairing” is much the same as the problem with “classy;” it gives an impression miles away from the one intended. It evokes not sophistication, but the dreary marketing-speak of consumerism. The current passion for anything to do with food and drink, cooking, regional cuisine, taco trucks, and so on is fun, and I certainly don’t mean to bag on that. Of course it is great to try, and maybe like, new things, and delicious things. But the fussy, mincing habit of attempting to create demand with a sniffy insistence on things like “artisanal” cheese or soda, coffee brewed in some Japanese contraption for eighteen hours, etc., is manipulative and artificial and stands in opposition to the fun part of sharing good things together. You never caught Elizabeth David or Marcel Boulestin promoting such stuff, or “pairing” anything, either. On the contrary, these masters of food writing advocated simplicity and lack of pretension. There’s a usage problem here, too. The word “pair” can only be used as a verb in certain instances; the OED allows it mainly for noting likeness, and for arranging couples for activities such as marriage, boxing, dancing or dinner. None of the examples they give covers the Amarone-and-stewed-plum variety. Comestible “pairing” seems to have started because of the weird cachet attached to drinking wine with food and spread from there. How much cachet can this tired phrase have left in it, though, when the Ernest and Julio Gallo website has got a whole Food & Wine Pairing Guide, and when you can visit any number of feckless blogs dedicated exclusively to this subject (foodandwinepairing.org, pairingsfoodandwine.com, matchmywine.com, etc.) 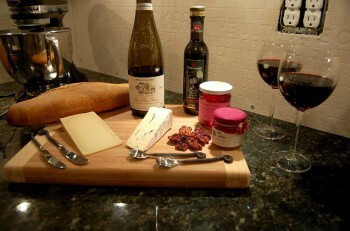 and learn what kind of wine you ought to drink with, say, bacon (a “challenging wine pairing”). How will you enjoy Gazebo Summer Blendâ„¢ this year? Let us know what food you pair it with or your coffee occasion. Summer BBQ or brunch? Share your pairing ideas with us. After reading this and having a disbelief occasion, my pairing idea is to pair sealing off the kitchen and turning on the gas in the oven with sticking my head in there. Photo by beeeeeker, from Flickr.